Hire DotNetNuke CMS developers from Macronimous on full time, part time or hourly basis! Macronimous offers DotNetNuke (DNN), a Content Management System which is ideal to create and develop commercial websites, corporate intranets, and extranets, online publishing portals etc. all over the globe. By using our DNN CMS, modification of content is made easy and also improves your overall look and feel of the website. Our DotNetNuke content management system is so simple to install and could be up and running in no time at all. Macronimous has a dedicated team of professionals, who are experienced and specialized in DotNetNuke CMS development that includes Content Management System (CMS), Portal Development and DNN Modules Development. Our user-friendly design makes life simpler for administrators, developers, designers and content editors to maintain their web assets. The CMS comes loaded with built-in features which include site hosting, content management, security and membership options that will provide you with excellent functionality. These could be managed and customized through browser based tools. Authorized users/persons can create, edit, add a title, add a description and publish web pages. Preview of the changes made by the administrator can be viewed easily before going live. 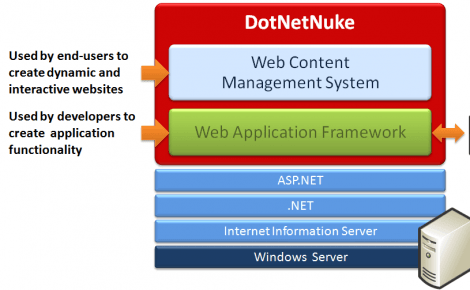 The following image explains the architecture of DotNetNuke. If you are looking out for DukeNetNuke development services like the DNN Content Management Systems Development, DNN Portal Development, and DNN Module Development, you have landed in the most precise place.